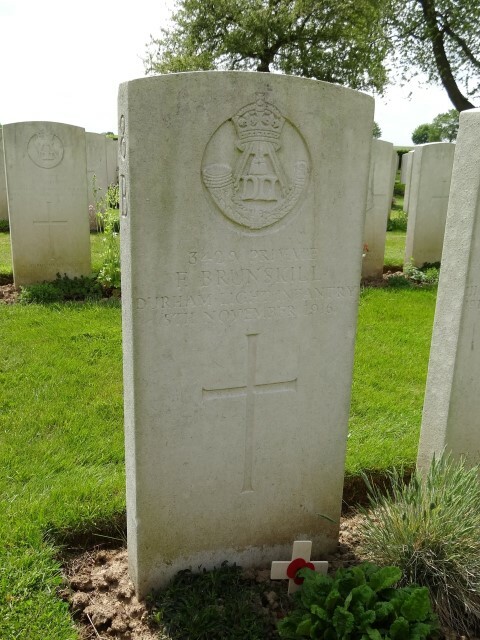 3429 Private Frederick Brunskill, 1/6th Battalion, the Durham Light Infantry was killed in action 5 November, 1916 and is buried in Warlencourt British Cemetery, France. He was 19 years old and is commemorated on the Etherley War Memorial in St. Cuthbert’s Churchyard and the Roll of Honour in St. Cuthbert’s Church, Etherley. Frederick Brunskill enlisted at Bishop Auckland into the local territorial force, the 1/6th Battalion, the Durham Light Infantry and was allocated the regimental number 3429. His service details have not been traced so the exact date he enlisted is unknown. The Battle of the Somme was viewed as a breakthrough battle, as a means of getting through the formidable German trenchlines and into a war of movement and decision. Political considerations and the demands of the French High Command influenced the timing of the battle. They demanded British diversionary action to occupy the German Army to relieve the hard pressed French troops at Verdun, to the south. The 1/6th Battalion of the Durham Light Infantry was to see action at Butte de Warlencourt, an ancient burial mound, located between the towns of Albert and Bapaume in northern France. Bapaume was occupied by German troops. 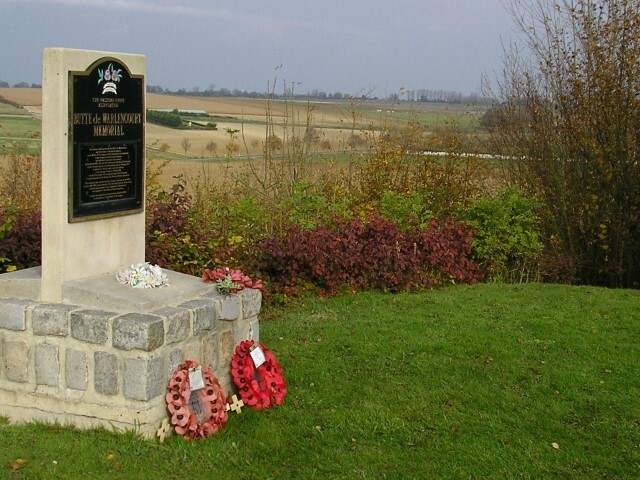 The British front line had advanced from a few miles north east of Albert in the direction of Bapaume to the feature known as the Butte de Warlencourt which lay a few miles to the south west of Bapaume. The Butte stood about 50 feet higher than the surrounding land and in theory provided a useful observation point for the Germans particularly towards High Wood and Martinpuich. The Butte was honeycombed with tunnels and dugouts which provided shelter for the German garrison. It had already resisted numerous British attacks over the previous month, October. The 1/6th Durhams was a battalion recruited mainly in Bishop Auckland and the upper valley of the river Wear, who to the rest of the D.L.I. were known as the “black-buttoned bastards”. The 1/6th were in the centre of the line. The 1/8th was to the right and the 1/9th, known as the “Gateshead Ghurkas” were to the left. Together they would attack the Butte on the 5th November 1916. The1/9th Durhams were charged with capturing the Butte and a quarry beside its west face. The 1/6 and 1/8th Durhams were to seize the Gird Trench and Gird Support Trenches. The 28th Australian Division was to attack alongside the 8th battalion. In support, to the right were the 1/4th Northumberland Fusiliers, to the left, the 1/6th N.Fs. and the 1/5th Border Regiment were in reserve. Zero hour was set for 0910 on Sunday, 5 November. The 50th Division attacked with 1/8 DLI (151 Brigade) on the right. The men had to pull one another out of the mud before they could start. They almost reached the German front line but were stopped by machine gun fire and gradually fell back during the day. The 1/6 DLI suffered a similar fate except on the left where they linked with 1/9 DLI in the line. The 1/9 DLI went through 2 lines of German trenches, reached the Butte and established a post on the Bepaume road – some entering the Warlencourt line. But these advanced posts were forced back and at 10.00pm the enemy were still holding the quarry and 500 yards of the German front line. By midnight the Durhams had been forced back – to their own lines. The only success came on the left where the 1/9th Durhams directly faced the Butte. Why this should have been is unclear but they swept up and over the Butte and by 10.00 the Durhams grabbed most of the low mound and the surrounding trenches, including the German front line trench, Gird trench. But the first German counter attack commenced at about 12.00. Bombing attacks then hand to hand fighting took place. The 1/9th Durhams were entirely cut off from any reinforcements by the accurate German artillery fire and well directed machine gun fire. As their numbers gradually dwindled, they fell back from their advanced position around the Butte to Butte Alley to where the 1/6th had its bloc. Despite the desperate need for assistance, they hung on until 18.00 when the enemy launched another determined counter attack preceded by a terrific bombardment. Yet more German reinforcements appeared, hand to hand fighting and bayonet charges bit deep, the exhausted Durhams had been fighting all day with no respite. Retreat had become inevitable and the precious gains of the morning were lost to the German counter attack. After hard fighting, the Germans were held back and so, after a day of drama and death, the situation was exactly as it had been before they started. On the evening of 6th November, they were relieved by the 1/5th Durhams who formed part of the 150th Brigade. Private F. Brunskill was killed in action 5 November 1916. He was awarded the British War and Victory medals. Private Alfred Brown, 1/6 Bn., DLI, born in Evenwood. He is buried in Warlencourt British Cemetery, grave ref. VIII. B.7 and is commemorated on the war memorial in St. Mary’s Parish Church, Staindrop. Corporal Ralph Hebdon, 1/6 Bn., DLI, born Barnard Castle and buried in Warlencourt British Cemetery, grave ref. VIII.B.6 and commemorated on the St. Helens Colliery Memorial Cottages memorial plaque. Corporal George Henry Smith, 1/6 Bn., DLI, born Barnard Castle and commemorated on the Thiepval Memorial and Barnard Castle War Memorial. Private Robert Wilson, 1/6 Bn., DLI of West Auckland and commemorated on the Thiepval Memorial and the West Auckland War Memorial. Corporal George Cox, 1/6 Bn., DLI born Evenwood and commemorated on the Thiepval Memorial and Evenwood War Memorial. No doubt in such close communities these service men were known to each other. So why had the Durhams failed 5 November 1916? Perhaps Brigadier General Hugh Tudor and Lieutenant Colonel Roland Bradford had the answers. It was a local operation, so costly and rarely worthwhile. Sadly, actions like the attack of the 151st Brigade on the Butte de Warlencourt on the 5th November 1916 had no real importance within the context of the Somme offensive. This kind of attack achieved nothing but swollen casualty lists. Any change in tactics would be too late for the gallant Durhams. 3429 Private Fred Brunskill, 1st/6th Battalion, D.L.I, of High Etherley, enlisted Bishop Auckland and buried at Warlencourt British Cemetery, grave ref, VIII.B.11. There are 3505 burials here, 1823 unidentified. There are several commemorations to the DLI who fell on 5 November 1916. Those in Durham Cathedral are recorded elsewhere. 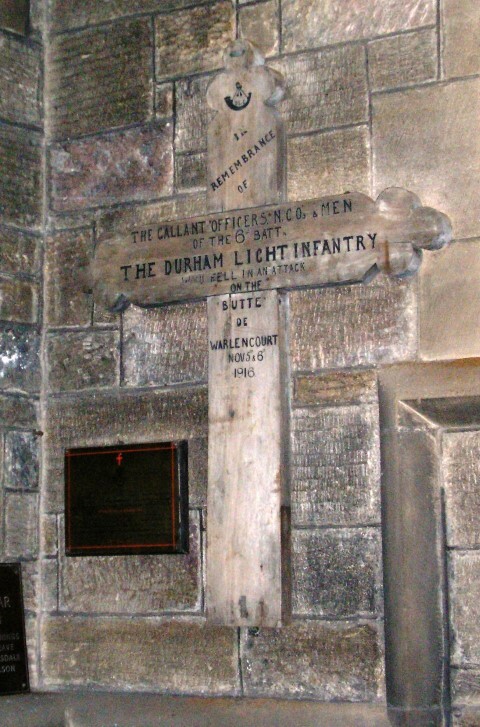 “This wooden Memorial Cross of the 6th Bn. The Durham Light Infantry was originally erected on the summit of the Butte be Warlencourt in the Department of the Somme, France immediately after the severe attack which they made there on the 5th and 6th days of November 1916. Butte de Warlencourt Memorial: The Western Front Association erected a Memorial to those who fell in the capture of the Butte de Warlencourt. The Butte is now clad with trees and the Memorial is positioned to the east on the high ground in a small clearing overlooking the battleground. Due to the dangerous nature of the site, access is by way of a clearly marked footpath. The gate is usually locked and only limited access is available. The Commonwealth War Graves Commission Warlencourt Cemetery is located about a kilometre to the north, visible from the Memorial and here lies other souls who lost their lives in actions about that time.